3. I like fixed top navigation bar, so we assign “navbar navbar-fixed-top” to menu control css class. For background image and proper layout we put the menu in div (navbar > navbar-inner > container). 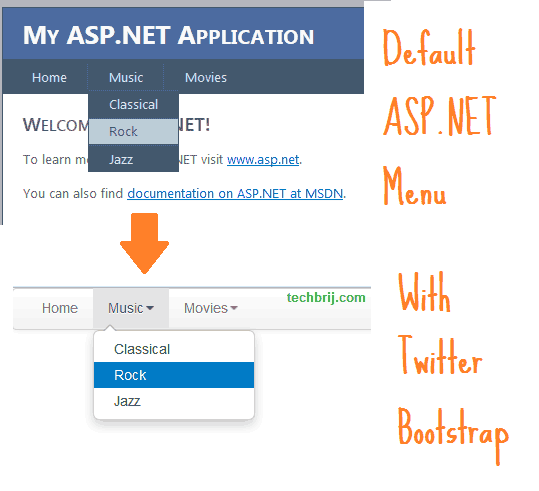 ASP.NET Menu creates its own styles and classes which creates problem in Bootstrap working. 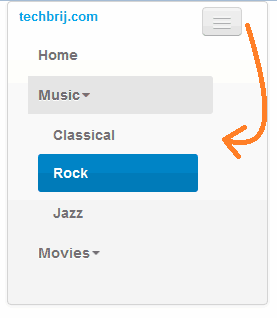 So we remove some styles using jQuery. Now on clicking parent menu item, sub menu will be displayed. May I know how to do the third level? How to remove the default setting for third level style of asp menu? Thank you. This is just for second level of the menu. Anyone can help? When I implement this all I get is my menus disappear…any help please? How to make Sub Menus open by Click and not Mouse hovering? This is exactly what I was looking for.. but does it matter what version of ASP.NET and Bootstrap this is done on? I have Bootstrap 3.2, JQuery 1.10.2 and compiling on an old ASP.NET 2.0 project and I’m not getting the same results. Brij, I utilized your advice to update my front page, however i didn’t get the result I was expecting. For starters my font size are too small and my entire menu bar and the items are missing. When I implement this all I get is my menus disappear…any follow up or help available? Any updates to these great examples with Bootstrap 3.0? I do not get backgrounds of menu.. The menu looks like links.